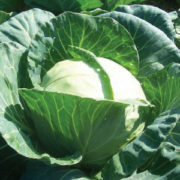 The Golden Acre is a tasty cabbage that arrives early and is suited for close spacing. This early round head cabbage is easily grown and versatile in use. Heads are about 6 to 7 inches in diameter on compact plants about a foot high. 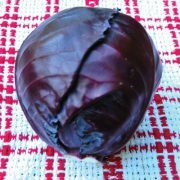 Its firm, medium green head is excellent cooked or raw in stews and salads. Cabbage is a fairly easy plant to grow, as it is a hardy vegetable, and also comes in different colors, such as red, green and white. Most cabbages will have smooth, tightly packed heads of leaves, but some varietals have crinkled leaves. 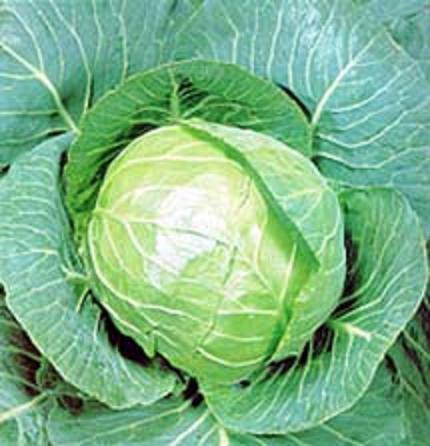 Cabbage belongs to the Cole crop family, like broccoli and Brussels sprouts and has more vitamin C than oranges. 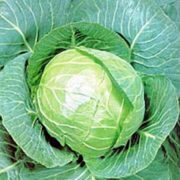 Before Planting: Cabbage require fertile soils in a pH range of 6.5-7.5, supplied with consistent irrigation throughout the growing period. Planting: Use early and midseason varieties for Spring crop. Sow 2 seeds per cell 1/4″ deep. Seedlings should be ready to transplant in 4-6 weeks. If possible keep soil temperature over 75°F until germination, then reduce air temperature to about 60°F. Transplant outdoors, 12-18″ apart in rows 18-36″ apart. Cabbage prefers cooler growing temperatures, between 55-75°F, but will produce decent crops under warmer, summer conditions. Use midseason and storage varieties for Fall crop. Start seedlings late spring and transplant to the garden in early summer. To ensure mature heads, seed the crop early in areas where heavy freezes occur early in fall. Successful cabbage crops can be grown where winters are mild. Transplants can be set out from September to February in these regions. 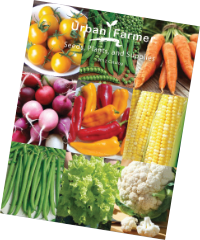 Sow 3-4 seeds 12″ apart, 1/2″ deep, rows 24-36″ apart, thinning to one plant in each group. Watering: Be sure to water evenly, as uneven water can split the heads. Cut back on watering as cabbage reaches maturity, as this also can split the heads. Days to Maturity: See each variety for maturity rate from transplanting. Harvesting: Relatively young heads (still green and actively growing) store best. Ideal conditions are 32°F at 95% relative humidity, with good air circulation. Tips: Cabbage plants do better when planted near herbs like dill and rosemary. Avoid planting cabbage near strawberries, tomatoes or pole beans. AVG. Seeding Rate: 100 seeds/50′, 500 seeds/250′, 1M/500′, 29M/acre at 2 seeds/ft. with rows 36″ apart.